A pamphlet produced in 1984 by London Health Emergency which is a guide for hospital workers on how - and why - to occupy hospitals to prevent their closure. libcom.org have scanned and put this text online today (in November 2006) since the issue of widespread hospital closures is again sadly very pressing - though this time round by a Labour government. Some of the information contained in the text is now out of date, for example some of the unions mentioned have since merged, and we now live in very different times, where occupations and solidarity strikes have disappeared from the memories of many people. However we re-publish this text in the hopes that it may provide ideas, inspiration and some practical advice to health - and other - workers and patients today on how to defend our UK health service. More notes on this text are given below. See also our Manifesto entry on Health. Will the workers get paid? How do we actually occupy? Management; should they stay or go? Hayes Cottage and Northwood and Pinner hospitals were both due to be closed on October 31 1983. They were occupied, and as a result they are now still open, with a temporary reprieve. Thornton View hospital in Bradford, occupied since last summer, now faces the imminent danger of a raid by District Health Authority bailiffs seeking to implement the order for closure issued by Health Minister Kenneth Clarke; but had it not been for the occupation, Thornton View would already long ago have closed down, and its geriatric patients bundled off to other hospitals. One general rule stands out from the whole experience of fighting the health cuts: it is not certain that occupying a threatened hospital will keep it open, but it is certain that if you do not occupy, it will close. Hospital occupations are not new. In 1922 workers at the Radcliffe Hospital in Nottingham occupied! Since the late 1970s occupations have increasingly been used to defend the hospitals scheduled for closure. Workers who have taken part in occupations have learned valuable lessons about how to organise them and how to anticipate some of the problems which may arise. With the present round of financial cuts, hundreds of hospitals are faced with closure. Since August 1983 there have been three occupations in hospitals which are still open in 1984 and many campaigns have asked for information about how to organise them. Every occupation is different, but there are things which are common to all occupations and that is what this pamphlet is about. Good early organisation can help to ensure that an occupation is strong within a short period of time and makes it much more difficult for management to move against it at the onset. This is not a failsafe guide or a list of easy answers. It is a sharing of tactics and strategies, learned in long, hard and often bitter struggles. It may not answer all the questions which apply to your particular hospital. Every occupation throws up new problems, new questions and new answers, but it will provide a basic framework for you to follow. An occupation means that workers in a threatened hospital take a decision to actively oppose the closure of the hospital by ensuring that patients and equipment are not moved out and by refusing to leave their jobs at the hospital. The main area where control is taken is in the movement of patients. A hospital can only be closed if there are no patients in it. So the main goal of an occupation is to keep the patients it has, if it is a long stay hospital, and to ensure new admissions if it is an acute general or cottage hospital. This is usually the first question which is asked. The answer is yes. As long as there are patients in a hospital, the Secretary of State is legally bound under the Health Services Act to ensure that they receive treatment, there must be workers; ancillary workers, nurses, doctors, technicians etc. Hospital doctors and particularly consultants will rarely support an occupation. This should not be a decisive factor in deciding whether or not you should occupy. The obligation to treat the patient means that even if the regular consultant resigns, a locum must be appointed as long as patients remain. Sometimes the consultants will be hostile and deliberately try to frighten workers and the public. If a consultant says, for example, that a hospital is ‘unsafe’, it is potentially very damaging. It is worthwhile checking your consultants’ commitments to private medicine, etc, as often they have a vested interest in a hospital closing — you can use the information in press statements to show why the consultant is not backing the occupation. Indeed the medical arguments are very often quite spurious; patient mortality during the St Benedicts occupation fell way below the national average, yet within six months of the end of the occupation 30% of the patients had died. Despite their hostility and lack of concern it is important to try to keep a good relationship with the consultants. Keep them informed of what is going on and explain in detail what the occupation means. GPs are the doctors who feel the sharpest edge of the cuts. They sometimes spend endless time trying to find a bed for patients and then following them up after a too early discharge. They are often very sympathetic to any attempt to stop cuts and closures. Doctors are organised in several different ways but the more radical and militant GPs are usually in the Medical Practitioners Union which is part of ASTMS. GPs are particularly important to approach if you are fighting to save a general hospital or a cottage hospital. Involve them from the beginning and get them to refer as many patients as possible to the threatened hospital. They will often require much encouragement because they are often not used to explaining themselves or their opinions to the public. Do you need to sleep in the hospital overnight? The workers in the threatened occupied hospital continue to come in and work their normal shifts. They may of course feel under more pressure, especially in the beginning, simply because they are taking a form of industrial action which is very different, and it may be unclear to them exactly what will happen. Occupations do put extra demands on the workers. There are extra meetings, pressure from the media for statements and interviews, extra time put in picketing, and dealing with management. Family life is often disrupted from its normal routine and it is important that people know this. But an occupation does not mean that all the workers need to stay in the hospital day and night until it is saved. What happens in the run-up to closure? Normally a threatened hospital is run down for a period either before closure — or, often, even before consultation on closure. At such a point the rundown has not been authorised by the District Health Authority, but is being done by an entirely unaccountable group of administrators and bureaucrats. Over the last five years there has been an almost identical pattern of management preparations for closures. Ancillary and nursing staff who leave are not replaced. Ancillary vacancies are left unfilled to ensure that there are fewer workers left to fight in defence of the hospital. There may be more agency nurses than permanent nurses. Maintenance and repairs are not carried out, making it virtually impossible to get routine health and safety work done or replace obsolete equipment. As a result, conditions for both patients and workers deteriorate. A steadily lower percentage of the hospital workers will feel committed to defending such a hospital, regarding its closure as inevitable. Some sections of workers may even be made vague promises of alternative posts in other hospitals, promises designed further to divide and confuse the workforce and weaken union resistance. Then, suddenly, the administrators announce that the hospital is becoming “unsafe”. Having deliberately created conditions to make the hospital unsafe, they then use this as a pretext to justify closing it down. These phase of “creeping cuts” is the insidious primary step towards closure. At each point it must be resisted. COHSE, NUPE and NALGO all have policies of “no cover” for unfilled vacancies. Shop stewards should ensure that this policy is implemented. At St Mary’s, Harrow Rd, the domestics were told to clean floors, when they had never done it before. Management were preparing the rundown of the hospital, and did not want to hire new people. The domestics refused this additional job, and in so doing provided a focus for other workers in the hospital who wanted to oppose the closure. Health and safety committees are particularly important — at the South London Hospital the Health and Safety committee forced management to make major repairs that they were hoping to leave and use later as fuel for their arguments about the hospital being in a “run down” condition. As soon as the word leaks out that a hospital is threatened (there are dozens in London alone) the workers and local community must organise. It takes time for the implications of closure to sink in. Most workers, although they are aware that other hospitals have been closed, think it can never happen to their hospital. But all health service facilities are threatened by the Tory cutbacks: to think that if another hospital in your District closes yours will be OK is disastrous. In Wandsworth, five hospitals have closed since 1978, and now the South London is earmarked for closure. Management use the fear of closure and the false hope of saving one place at the expense of another to try to pit worker against worker. All work necessary to close hospitals should be blacked by the unions. Stewards should oppose three and six-month contracts which make it easier to assimilate people from the hospital about to be closed. Usually a District will only issue “temporary” contracts for a whole year’s run-up to closure. So, new staff are effectively sacked in order that workers from the closing hospital can be “slotted in”. The whole process undermines trade union activity and militancy and makes some workers wary of even joining a union in case they jeopardise the renewal of their contract. Workers in the threatened hospital must refuse even to discuss alternative employment with management. They should ignore any letters or demands that they get from supervisors telling them to attend meetings (usually on their own) to have preliminary discussions. Health Service managers are now experienced in the techniques of closing hospitals. They try to do it quickly and quietly through administrative measures and intimidation. They do not like well-organised campaigns with experienced people who know their tactics. The must successful fightbacks — EGA, St Benedicts, Longworth (Oxfordshire) and St Mary’s — have involved workers and supporters meeting together either weekly or fortnightly. Meeting in the hospital is best, because the workers will see people coming in every week to sup port them and the supporters will feel part of the hospital (and know its layout). It may seem too frequent at first; but managers work very quickly, and things can change on a daily basis. There is no need to ask for permission for these meetings; management will almost certainly refuse. Just pick a room and have the meetings. It is unlikely that administrators will make an issue of it as they do not want to provoke action early on. A public profile is essential. Everyone in the community should know that their hospital is threatened. Leaflets, posters, petitions, pickets and demonstrations are all good for attracting interest. Workers who are a bit frightened about fighting management and are not sure about the levels of support they will get can be bolstered by seeing a large demonstration or a lot of people turning up to picket outside the hospital. It is important to challenge management at every step of the campaign. The administrators and consultants will constantly be putting out statements about the terrible financial conditions, weeping crocodile tears that they have to close the hospital, and claiming that they really have no choice since there is no money available. Workers should be reminded that in 1982 health workers were given the same arguments about why we could only have a 4% increase in pay. There was “no money” then; but suddenly billions were found for the Falklands War, and extra money was handed to the judges and the police. Money is available but the Tories refuse to spend it on health. Health Authorities are weighted in favour of the wealthy and the ruling class; Norman Fowler, who appoints them, sees to that. However in several Districts in London there remains a real possibility of DHAs taking a stand against cuts if only the Labour Party representatives on the DHAs would vote against. Labour Party activists should get their General Management Committees to adopt a position that members of the Party who sit on health authorities must oppose cuts, closures and privatisation. Health workers who fight the cuts will be putting their jobs on the line. Any industrial action is likely to bring them up against the Tory anti-union laws. Workers will be fighting management, often the police, and even some trade union leaders reluctant to take a stand. Workers face possible fines and imprisonment for strike action and picketing. The very least Labour Party and trade union members on health authorities could do is argue and vote against closure. Yet at meeting after meeting we have heard some of them saying that they must stick within the Tory cash limits (because Norman Fowler says so); and therefore they must make the cuts. This is a scandalous argument. Let the Tories try to make their own cuts. The task of the labour movement and its representatives is to defend the working class. Nor should District Health Authorities be allowed to make their cuts in a quiet room with only a few people there. Members of the public are allowed into the meetings. Many people do not know this. Indeed DHAs in many cases hold their meetings in rooms too small for more than handful of observers to get in. This can and must be challenged. In Oxfordshire, persistent mass lobbying and the invasion of DHA meetings forced them to begin holding meetings in large, public venues: a small but significant blow for democracy and accountability. Make sure that there are a lot of people at the meetings where cuts are being discussed. You are technically not allowed to speak: but why should a totally unelected and unaccountable body be able to ruin the health of the community in silence? Disruption of DHA meetings has proved valuable in the past, and it shows the administrators that they will not have an easy time trying to close the hospital. But the real way to win and to save hospitals is by united industrial action, focussed on occupation. There have been several successful hospital occupations since 1977. The decision to occupy is not taken overnight. There needs to be preparation. If you are thinking of occupying your hospital, contact someone who has done it. Get her/him to come to the hospital and talk to people, answering questions and explaining directly what an occupation means. Sometimes it is only a handful of workers who decide that they will not let the hospital close. They take the initial action and bring the other staff along with them throughout the course of the occupation. This happened at Hayes Cottage in Hillingdon and also at Thornton View in Bradford. In other occupations there have been mass meetings with ballots. This happened at Northwood and Pinner Hospital. All three have been successful occupations. Obviously the more staff who are involved the better. However, experience has shown that even when only a small number of workers take the initial action other workers will continue to come in and work and can be won over to supporting the occupation. It is often domestic workers who take the initial action, with very passive support from nurses. But once nurses see the hospital still running “normally” as far as patient care goes, and see management powerless to stop the normal running of the wards they may increasingly give active support. Workers will naturally be worried about being sacked, victimised, struck off or blacklisted. It is important not to dismiss these fears, but to have a frank and honest discussion with them. Nobody has ever been struck off the nursing register for supporting an occupation. Even the Royal College of Nursing has given tacit support, usually instructing its members to “stay with the patients”. The fear of victimisation is more difficult to dispel. The strength of an occupation lies in collective action. The more staff who are involved, the more difficult it is to victimise anyone. Decisions are made collectively. But it would be dishonest to say that there is no possibility of anyone being victimised. Unions must be pushed to demand no victimisation, and to give assurances that they will fully back any member who is threatened, with strike action in other hospitals if necessary. Many workers who have occupied their hospitals have not been in a union at the start of the action. It is important that the workers in the occupied hospital do join a union and that there are stewards elected on site. The union full-timers should be informed as soon as the occupation has been declared and be asked to make the action official. NUPE, COHSE, TGWU, GMBATU, and ASTMS have policies of supporting occupations and will usually make them official immediately. Although they will give you official support, most full-time union officials do not have much knowledge or experience of occupations. They should be pushed to provide practical support from the beginning - money for leaflets, posters, stickers, duplicators, paper, equipment, etc. You should also ensure you are able to contact an official at all times. If you can contact someone who has had practical experience of occupations to be at the hospital for the first few days it will be an advantage. District Joint Shop Stewards Committees, where they exist, should be actively involved from the beginning. If there is not one in existence then a meeting should be convened of all the NHS stewards in the District in order to get support. It is essential that workers in the other hospitals know what is going on and give their support to the occupation. When a hospital is declared occupied there are some things that need to be done immediately. It is almost impossible to run an occupation without access to an office and a telephone, or a room in the hospital to be used as a base. In planning the occupation, you should decide in advance which office is best to take over. Often it is the Administator’s or Nursing Officer’s. This has the added advantage of displacing the people most likely to try to intimidate and disrupt the occupation in the first few days. THAT if you attempt to enter by violence or by threatening violence we will prosecute you. You may receive a sentence of up to six months imprisonment and/or a fine of up to £1,000. Once the occupation has been made official by the unions add “THAT this is a trade dispute and is an official trade union occupation.” Have this notice already written out and put it on the office door, the hospital entrance and on the gates of the hospital immediately. If there is a switchboard, talk to the operators immediately, preferably with their union steward present. If they have not been involved in the planning stage explain to them exactly what is happening. Ask them to keep on giving you lines. If management are still in the hospital it may be necessary to have someone — a steward, official, or occupation committee member on the switchboard to keep management Out and stop any harassment of the operators. Contact the Post Office Engineering Union (POEU) immediately. Tell them what has happened and ask them to black any instruction to cut off the phone. Tell them you will be applying for a new line the next day and ask them to give the application top priority. Get an application form in for a line independent of the hospital. This has been invaluable in recent occupations. It ensures that you cannot be cut off, If you do not know the local POEU rep, either contact the Trades Council, or ring the operator and ask for the engineers to ask them for the name of the steward. Contact the local ambulance service stations. Talk to the stewards and tell them what you are doing and ask them not to cross the picket line to remove any patients without prior consultation with the occupation. If you are occupying an acute general hospital with an accident and emergency department, ask them to continue bringing patients into the hospital unless instructed not to by the occupation committee. If you are trying to keep an A&E open it will require very close consultation with the ambulance drivers and with the casualty clerical officers, to ensure a continued in-flow of patients. London Ambulance Service, unlike that in many rural areas, has a long history of support for occupations. At least 50% of London Ambulance workers are in NUPE. If you are occupying a long stay hospital, lock the front gates with a padlock and put a picket there to let staff, supporters and visitors in, but to keep management and the police out until the occupation is secured. Bring the padlock and locks with you on the day you declare the occupation and make sure that there are enough people around to cover all the immediate jobs that need to be done. A twenty-four hour picket may be necessary from the beginning. Ensure that pickets know the rules and regulations, are well-informed and have up-to-date information on who is to be let in, who is to be kept out, etc. Make sure that someone capable of making quick decisions and who is reliable is in the office. Get a meeting together to explain exactly what has happened for the benefit of staff who have not been involved in the planning and the timing of the occupation. Reassure staff that what they should do is continue to work as normal. It is often useful to have a sympathetic nurse on hand who has been involved in an occupation. If a meeting is not possible, go around to all the wards and departments and explain what is going on. This is essential in order to bring people who are unsure, frightened or hostile into at least passively supporting the occupation. Prepare a leaflet for distribution the day after the occupation begins. Also prepare a press statement. Regular bulletins for staff are essential because of the shift patterns and the impossibility of getting everyone to a meeting at the same time. It is also important to change the exterior of the hospital. Fences should be covered with posters and banners proclaiming the occupation, displayed in prominent positions. Make sure every passer-by knows that a struggle against health cuts is going on. It is the workers who must make the decisions about how the occupation will run. If there is good unionisation then the Joint Shop Stewards Committee may be the occupation committee. If, as is quite often the case, the hospital is weakly organised, then there will need to be an occupation committee set up with representatives of all departments and all staff. It does not have to be the same people all the time. As many staff as possible should be encouraged to attend. It is useful at first to have someone at these meetings who has experience of occupations and who can answer questions that arise. But any decision must be made by the workers themselves. The committees may need to meet every day during the first week or two and then it should meet as regularly as the staff think necessary (once a week is usual). Management: should they stay or go? At some point in nearly every Occupation, management have been barred. The time to do it depends very much on the strength of the occupation and the role of the managers. There are no hard and fast answers to this question but some norms can apply to most occupations In almost every instance administrators will be working to break the occupation as quickly as possible. They may appear friendly, paternalistic and nice but their role is to regain control of the hospital in order to close it. Do not trust them. The lesson which all of us involved in occupations have learned, is that hospitals run perfectly well without senior administrators and managers. Both management and police — if they arrive — will ask who you are, whether you work in the hospital, who is in charge etc. You are not obliged to give your name to anyone and you should not give it. Don’t mention names of anyone ‘in charge’ or connected with the occupation. Management will have the names of stewards and they can contact them if they want. Be firm and polite. The legal notice is clear. Neither an administrator nor a nursing officer, nor even a police officer has any right to enter without permission If the administrators say that they are worried about the patients, tell them that they can ask a doctor of their choice to come in and check on the patient care. The recent pattern has been that senior management who are not normally based at the hospital, come back for the first three of four days demanding to be let in. Then they tend to give up, go away and try to think of another way to harass the occupation. Once the more reticent workers see that very senior managers have been turned away but that no-one has been sacked for it, and there has not been any action taken, they tend to get a bit more confident in supporting the activists. The occupation committee should discuss and monitor the position or any management normally on site; administrators are usually easier to ban than nursing officers. In many occupations the senior nursing officers have been allowed to stay but they have been “shadowed” by a supporter or member of the occupation committee. This reinforces the impression that the workers are in control and making the decisions in the hospital. It also prevents these people from undermining the occupation by intimidating staff individually. The whole question of what to do with nursing officers is very delicate and should be discussed fully with the nurses before any decisions are reached. But always be wary of back-door agreements, and refuse to have anything to do with them. They can only undermine your base and endanger the politics of the occupation. Occupations need a lot of help to run smoothly and to win. It is essential to get as much outside support as possible. Hospitals belong to the community and they will want to help defend their local hospital. There should be a rota set up for pickets which will include both staff and supporters. Factories and other workplaces, tenants organisations, Labour parties and community groups all need to be approached for help. There should be regular supporters’ meetings so that everyone knows what is going on, there should be good liaison and communication between supporters and the occupation committee. Regular bulletins are good for sharing information. An occupation diary should be kept in the office. Pickets should be encouraged to read it when they come in for their stint, and to write up details which they feel to be of use. Get names, addresses and telephone numbers of anyone who offers help. Get them to give a regular commitment to picketing. Begin to work on developing a telephone tree, which is a system of contacting people by phone in an emergency. It usually works by three people telephoning three other people who in turn phone three people until all the supporters are contacted. The important point for supporters to remember is that the hospital is running as normal, as far as patient care is concerned. Patients’ privacy is a top priority. No supporters should be allowed in the ward areas. No drinking should be allowed on the site during an occupation. Health workers are not used to ‘outsiders’ walking around hospitals. Management will inevitably play on this, trying to discredit pickets who are not staff members. Everyone has a right to defend their hospital that is why people come to support occupations. Staff at occupied hospitals are doing their normal job — often physically and emotionally exhausting. They are also taking an active role in running the occupation and so cannot keep the pickets going on their own. If they are women, they are often under intense pressure at home because of their increased commitment. They need support. The labour movement was built on solidarity; and that is what occupations are about. This Tory government has no conscience about bringing in its own outsiders to run down the NHS - Griffiths, a grocer from Sainsbury’s, is advising them on how the NHS should be run! Private outside contractors are looking to increase their profits by getting NHS contracts. We should make no apologies for taking advice and help from people prepared to help save hospitals. Get the local press on your side. Management will try to discredit the occupation by saying that patients are at risk. Have a press conference as soon as possible. Issue a press statement as soon as you have occupied. Invite the press in to film or photograph the occupation and let them see for themselves that everything is running well. Patients will usually gladly give their permission to be filmed if it means good publicity for the hospital. Delegate someone to he the press officer and make sure that whoever speaks on behalf of the occupation is authorised to do so, and that reporters know who to ask for. A sympathetic story in the local paper is worth more than a thousand leaflets. Always stress that “patient care” is being maintained. Get the relatives involved immediately. Let them all know what the occupation means. A leaflet should be produced and a relatives meeting organised as soon as possible. Workers in geriatric hospitals in particular have had great success in getting relatives to take an active part in supporting occupations. Get the patients involved if possible. They will be the most affected by the closure. At St Benedicts, patients joined in with picketing, and in Thornton View they have given radio and television interviews. Try to get relatives to make a supportive press statement in the first few days of the occupation. Occupations cannot win without support. In order to avoid the kind of raids which ended the Hounslow, St Benedicts, Longworth and Etwall occupations, it is necessary to get sufficient outside support to make the District Health Authority hold back from sanctioning a raid. This has to be done by getting other workers in the District and the Region to pledge supporting strike action immediately any piece of equipment or patient is forcibly removed from the hospital. It is not easy to get these pledges, and they must be worked for from the first day of the occupation. Management tactics are to divide and rule health workers. They know the importance of strike action, and that is why they try to exploit other health workers’ fears of redundancy and cuts by threatening them that if the occupied hospital is saved, their hospital will be cut. Such claims have to be dealt with very quickly. Every cut, every closure makes each subsequent one easier for management to accomplish. Every victory against cuts and closures makes it more difficult for Districts to make more cuts, because it encourages others to fight. That is why promises of supporting action are so essential. They break down the isolation of occupations, and make them a focus for broad resistance to the cuts. Experience has shown that while trade unions will give quick recognition to occupations, union officials will not build for supporting strike action. In some cases they have deliberately worked against it, defusing and diverting the issue, and making the workers occupying think it is impossible to win supporting action. It is by no means easy or automatic: but it is certainly not impossible. Don’t leave the work of building for supporting strike action in the hands of union full-time officials. Get stewards and workers from the occupation in every branch to raise the issue, ask for support and to explain why support from other workers is so vital. Increasingly the law is being used against trade unionists, and the health service is no exception. Injunctions were used for the first time during the St Benedicts occupation, and have been used in several occupations since then. The law is complex and has been used in different ways in different occupations. The best thing to do is to contact your local law centre, and ask one of the solicitors to come to the hospital to explain the legal position. If you don’t have a law centre try to find a sympathetic socialist lawyer in the area. Injunctions can be issued to named individuals and to “any others”, to demand that they comply with certain conditions. Management may take out injunctions early on; or maybe not at all. The fewer names they know the better. When they are applying for injunctions you will be informed. Contact the law centre solicitors and/or the union legal officers immediately. If the injunction is granted, it must still then be served. During the Hayes occupation, administrators were only able to serve one out of three injunctions, and eventually they just gave up. The use of the law is a frightening and intimidating process for people who have never come up against it. It is important that the workers involved in occupations have things explained to them by someone who knows what the current legal position is. The main thing to stress is that an occupation is not a criminal offence and is not “illegal”. Recently, in the Hayes and Northwood occupations, the law was used for the benefit of the occupation. This was an unusual and exceptional event! It is always worth pursuing any legal points which may help an occupation, but the law is not usually on the side of people fighting cuts and should not be seen as a substitute for action. An occupation should never be called off pending legal action or a court action. The Hayes occupiers themselves declined to take part in the legal action against the DHA, preferring to rely on their base of support in the working class rather than trust the courts. Why should we occupy when other occupations have not kept hospitals open? This question is always asked. There is no easy, sure way to keep a hospital open. Workers at St. Benedicts spent ten long, exhausting months occupying to see, at the end, a vicious raid by private ambulances with the help of the police, taking the patients out and closing the hospital. There had been no pledges of supporting strike action; and so management had felt confident that they could move. But the public disgust at the methods used and the closure of the hospital provoked such a backlash that it was another three years before that health district has even suggested that another hospital should be closed. Hayes Cottage, Northwood and Pinner and Thornton View hospitals are all still open more than six months after they were due for closure, thanks to determined occupations. Remember, it is not certain that occupying your hospital will keep it open — what is certain is that if you do not occupy it will close. It is also certain that every time we fight a cut or a closure, the ripples are felt. If there had been no resistance to the closures in the past, we would be facing even more devastating cuts than the Tories are now proposing. Every time a hospital, ward, or department is occupied, it is a clear sign to the government that they cannot easily cut our services. Occupations are never a waste of effort. They politicise workers very quickly. Health workers are locked into a very hierarchical system which is extremely undemocratic and oppressive. Decision-making is entirely out of our hands. Occupations give the decision-making back to the workers. A cleaner who stands at a gate telling an administrator to go away is in control. The hospital is running, ‘under new management’, under workers’ control. The whole process of occupying shows workers that they can make major decisions about their hospital, and that when they are in control it usually runs better and smoother. It makes us think about the reasons for the cuts and closures. Where does the money go? Why can’t we keep the services for local people and cut out the vast profits that go to the drug companies and other suppliers and contractors? Why do health authority accounts have to be so secretive? Why can’t health unions and other trade unionists examine the books to expose the details of how the District allocates its money? Occupations rally whole communities around defence of health care. For the first time, ordinary people go to Health Authority meetings and see the scandalous group of non-accountable, appointed people who make life and death decisions with no thought for what we have to say about it. People start talking about not only defending what we have, but demanding what we want. Occupations are not easy. They require a lot of hard work, a lot of commitment, and can be exhausting. The alternative is to let successive governments ‘rationalise’ the health service right out of existence. At the moment there are three hospitals which would have been closed in 1983 which are still open because the workers occupied. Those three could be multiplied by hundreds. The possibilities of keeping hospitals open exists. That is a good enough reason to consider occupation of your hospital. * London Health Emergency was set up in 1983 with GLC support to coordinate local campaigns against health cuts in London. We are run by a Steering Committee drawn from local campaigns and union delegates. * We are committed to: reversing the present health cuts; combating privatisation; and democratising the NHS. * We will be producing a regular bulletin as well as pamphlets, leaflets, posters to support the local and London-wide struggles against the cuts. We can provide speakers for trade union, Labour Party and other meetings on the cuts. Our aim is to support struggles under way against the cuts and privatisation, and to create the kind of local campaigns which can encourage health workers wherever necessary to take industrial action — strikes, work-ins, or supporting action — to defend jobs and services. * There are now campaigns in all 31 London health districts. * Also affiliated to London Health Emergency are: NUPE; GMBATU (Southern Region); Districts and branches of NALGO; ASTMS; COHSE and NUPE; and several Trades Councils and Community Health Councils. * To succeed we need far more affiliations from union branches, Labour Parties, community and other organisations. A single (1~lO) fee affiliates your organisation both to the local health campaign and to London Health Emergency. In exchange we will send up to 100 copies of our bulletin, and regular mailings on events and struggles London-wide. * Make sure your organisation affiliates. 3 A mass picket of the Area Health Authority as part of the occupation of Hounslow Hospital (1977) supported by the Confederation of London Area Health Stewards – "CLASH". 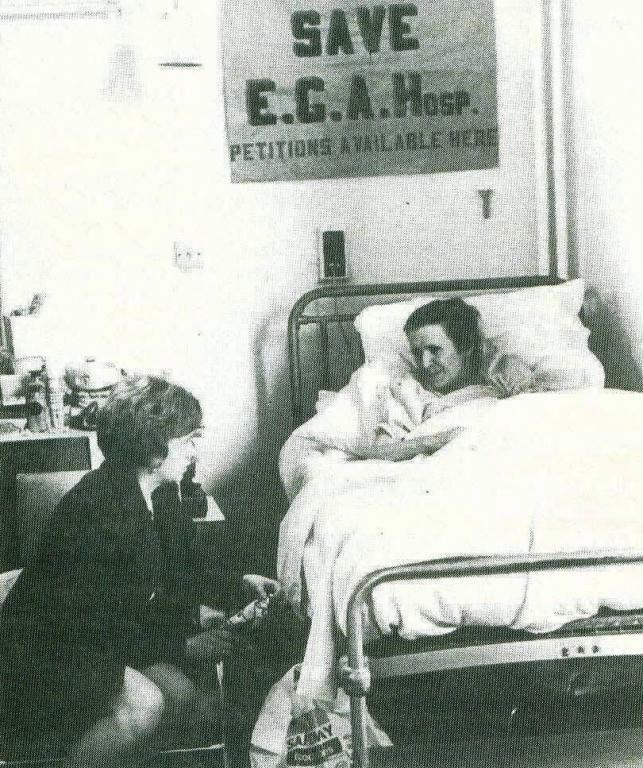 4 Bethnal Green Hospital campaigners lobbying the DHSS at the Elephant and Castle in 1978: They successfully held up the closure of casualty for over two years. 5 The aftermath of the management raid which ended Hounslow occupation in October 1977; this type of management vandalism can be prevented only by firm pledges of supporting strike action by groups of health and other workers. 12 Thornton View occupation, Bradford: in this instance a small core of workers decided they would not let the hospital close. Their lead was strongly supported by their fellow health workers, patients and relatives. 13 Still perhaps the best-known of the hospital occupations, the work-in at the Elizabeth Garret Anderson Hospital was the first major fightback against government spending cuts, beginning in 1976 and lasting into 1978. 15 Once nurses see the hospital still running "normally" and caring for patients, many will give increasingly active support to occupations. 17 Mass picket outside the St Benedicts occupation, which was brutally raided after nine months of work-in in 1980. 19 Occupations in Hayes Cottage and Northwood and Pinner hospitals in the autumn of 1983 were both successful in winning at least temporary reprieve. Without the action, both would have been closed. 23 The main victims of government cuts and enforced closures are of course the patients; within six months of the raid on St Benedicts (above) 30% of the patients were dead. OCRed for libcom.org by Linda Towlson, slightly edited by libcom.org for spelling and grammar. Occupational therapy - the University College Hospital strikes and occupations of 1992-4. A pamphlet about a later hospital occupation. This sounds a bit too good to be true. If all you have to do to keep a hospital open is stop patients from leaving then it's probably quite straightforward to pull off an occupation. I think the law's changed a bit since this was written; I know under the NHS & Community Care Act the duty on the local authority to provide social care doesn't put much of an obligation on them as to where or how the care is provided, so the authority isn't under any pressure to keep specific units open as long as they're funding something similar in the same area. Is this the case in hospitals too? If so then it might not be quite as easy as the pamphlet makes out. I'd imagine quite a bit of the legislation mentioned here has changed since the 80s (DHAs don't exist any more either as far as I know). Could anyone give us an update? Have there been any more recent occupations in the UK since the 80s?